Until I married my husband, I was child-free. Because of him, I have two great stepchildren. Granted they’re not with us full-time, that still makes me a stepmother with certain responsibilities. Further, I’ll be popping out a baby in a few months, so I’ll definitely not be child-free. Just because I don’t have any children, it doesn’t mean I don’t have other obligations or priorities that I’ve set for myself. If free time and disposable income are so important to you, maybe you shouldn’t have had kids. Thank you for letting me know that I’m incapable of feeling tired. Really? Maybe you should have addressed your issue of self-worth prior to having children. No one should rely on having children in order to find meaning in their lives. Who ever said you, as a mother, can’t look good? Don’t use your child as an excuse. So what if the woman regrets it? She made the decision herself. She’s well aware of how consequences work. That is such flawed logic. Kindhearted, caring women can apply their skills and qualities elsewhere. They don’t have to be mothers just because they’d be good at it. She’s not waiting. She just doesn’t want kids. The end. I honestly heard this and I thought it was the most ridiculous perception of what marriage meant. All that money saved by not having a kid can be spent on their very own caregivers, who can treat them better than some children treat their own parents. Nothing to worry about there. I’ve always wanted children, for my own reasons. That said, others can rightfully choose the opposite. Who are we to judge? 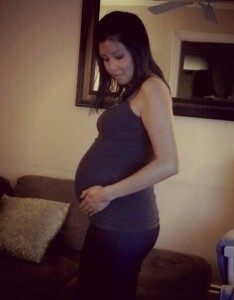 I made it fairly smoothly to the third trimester! It was just last week when my lower back started to ache, but that’s manageable so far. All has been good! I’m hoping for a relatively comfortable last trimester! In Ontario, to change your name after marriage, you can either legally change your name or just assume your spouse’s name. A legal name change requires you to also change your Ontario birth certificate, which is odd. I’m trying to cross everything off my to-do list and changing my name was one of them. I finally got around to doing it today and although, this didn’t require much mental preparation, I was totally caught off guard for other reasons. I recently renewed my cards with new photos, so I didn’t expect this one. I had just come in from a brisk 15 minute walk and was fully winterized – multiple layers, gloves, boots, toque, etc. I was all warm and sweaty, my face was red, and I had bad hat head. I’m so [not] looking forward to my IDs. It never dawned on me that I had to change my signature! When I was young, I used to have a blast thinking of creative ways to write my name. And since I decided on my “adult” signature, I never thought about it again. There I was, at the counter, being asked for a brand new signature. Eek. I quickly drew one up, hoping I won’t hate it. Well, after 6 months and that short ordeal, I finally did it! Name assumed. As promised, here’s another Megan Nielsen maternity pattern review. Like her skirt pattern, this one was super easy. It took about an hour to cut, sew and finish. I used the right type of knit this time, so it fits quite comfortably. Use a twin needle. Especially for knits, this is the way to go. Unfortunately, I didn’t use one, so my knit edges roll up slightly. Use the seamless option of the pattern. I didn’t, and I find those extra seams add extra bulkiness to the wrap. There ya go! I’ll be using this pattern again to make a top in another colour! I recently read an article about the benefits of dates (the fruit kind) and pregnancy. A study published in the Journal of Obstetrics and Gynaecology showed that women who ate dates daily during their pregnancy were less likely than non-date eaters to need medication to start labour or to help it keep progressing. Labour was also significantly shorter for those date eaters. 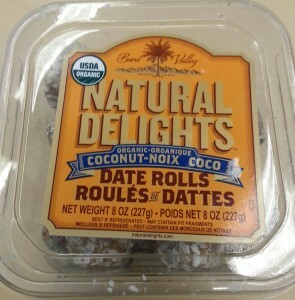 They are Natural Delights coconut-covered medjool dates. I gave them a try and they are delicious! I have to admit, they are really sweet, but with my sugar cravings, they fit perfectly in my diet. I also found this brand at No Frills (for much cheaper – $3.50/8 oz box), so I bought the almond-covered ones, and they were just as delicious. It would be awesome if these dates do help in the delivery room, but if they don’t, at least I’m enjoying my new treat. To share my new discovery, I’ve been going around the office offering people a date, and along with me getting some pretty witty responses, they’ve been a hit!